Pressing your Apples is a relatively straightforward process in theory. To press your pomace and extract the maximum quantity of juice you need to apply a little pressure. Whether you use a sophisticated fruit press or simply use old boards and heavy weights is entirely up to you. In practice, the more pressure you can apply, the more cider you will get. The basic technique is to wrap some pomace in muslin or hessian cloth (so it all stays together) and squeeze the cloth till all the juice runs out and is collected. So, let your imagination run riot. If you have a large bench vice, you could build a press using nothing more than this and a couple of old kitchen chopping boards. How about an old three legged stool sitting in a large ‘flexi tub’ bucket (to catch the juice), with the pomace in muslin on the stool and then covered by a piece of off cut melamine (from a kitchen surface) being sat on by the heaviest person you know? Of course even the fattest of us will only apply about 80lb per square foot. 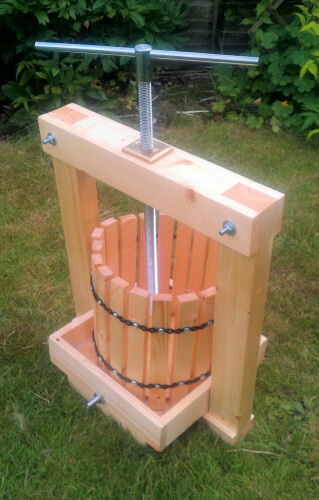 To really get as much juice out of the apples as possible, you could build an apple press from scratch like we did a few years back. Here are the instructions. It is not as difficult as you think and does the job. Alternatively there are fruit presses for sale of all sizes. Here is the commercial ten litre press which replaced our homemade version. We chose the ‘cross press design because it is easier to load and clean than cheaper presses where the spindle sits permanently in the middle of the basket. However this is personal choice. However, one tip worth listening to is that a ONE LITRE PRESS is just too small for cider making. My point is that getting the juice from the pomace is actually quite easy, so take whichever route you fancy (except a one litre press… trust me on this). Some people take the squeezed pomace, add water, let it rest for a few hours and then squeeze again, to get more juice for their effort. However, this is never going to produce as good a cider as first pressed juice. Useful tip though if you need to make up enough to fill and almost full demijohn.